Falling Obama is an interesting ragdoll game. This game has simple graphics, suitable for all ages, especially children and families. You can experience this game on your browser because it is a flash game. Do you know President Obama? 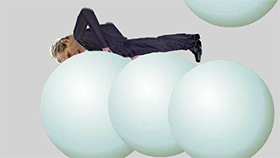 In this game, your task is to drag Obama through the giant balls. This game has no challenge and time pressure, so you can play it comfortably. At the start of the game, Obama will fall automatically to the balls in the map (Obama is a ragdoll character). You can use the mouse to drag Obama to whatever position you want. You can help him dodge the balls or you can drag him into narrow spaces between balls. With fun gameplay and simple graphics, Falling Obama will bring you moments of relaxation. Good luck and have fun!